Suzuki is one of the Big Four Japanese motorcycle manufacturers and has won world championships in every discipline of motorcycle racing. Here’s a look back over the trail, enduro and motocross models that stood out in Suzuki dirt bike history. Founder Michio Suzuki started off in 1909 in the textile industry producing weaving looms for Japan’s massive cotton industry. After World War II Suzuki began producing engines which could be fitted to bicycles as a response to the need for affordable transportation in Japan. 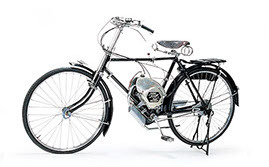 In 1952 Suzuki built its first motorized bicycle, the ‘Power Free’. It used a 36cc two-stroke engine fixed to the frame of a conventional bicycle. 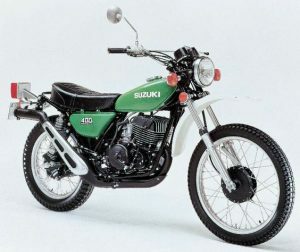 By 1954 Suzuki was mass producing motorcycles, and the Suzuki Motor Company was formed. 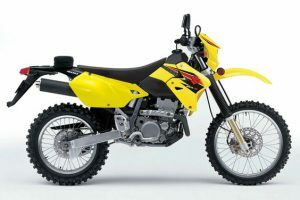 Suzuki has remained with its yellow color motocross bikes throughout when most of the other manufacturers have changed several times. In 1958 the now famous Suzuki ‘S’ logo was first used. In 1962 Suzuki wins it’s first world championship in the 50cc TT class, with five more following in the next six years. In 1971 Joel Robert wins the 250cc world motocross title, and Roger DeCoster wins the 500cc class on the Suzuki RN71. 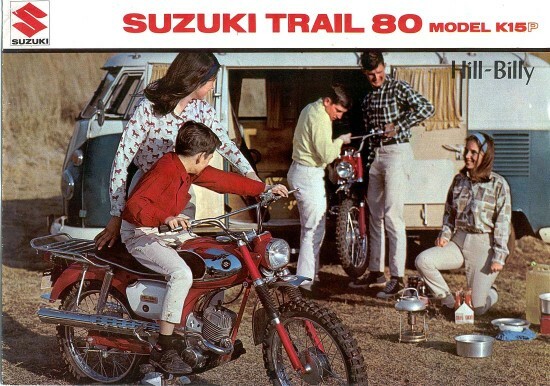 Suzuki’s first entry into the trail bike market came in 1965 with the K15 Hill-Billy. It was an 80cc two-stroke which came with knobby tires, a raised sport-type front fender, spring-loaded folding footpegs, and a skid plate under the engine. It was a big success in the USA. In 1967 the K15P was introduced. Among its new features was the ‘Posi-Force’ automatic oil lubrication. The K15 model still required you to mix your own oil and gas. In 1969 the TS series was first introduced to the mass market. They were air cooled and were introduced alongside the TM series (Motocross), TC series (Trail with dual range gearboxes), TF series (Farm) and DS series (Dirt Sport, no turn signals, and smaller lighting). They shared the same engine and chassis design. I personally have owned the TS90 (my first bike at age 15), then the 125, 250 and 400. They were bulletproof and never missed a beat. They were one of the first bikes to have pointless CDI ignition and separate oil tank which meant no premixing fuel. 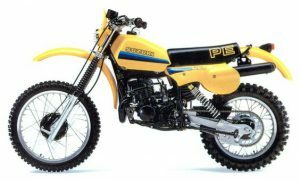 The PE ‘Pure Enduro’ series was based on the hugely successful RM motocrossers but were produced with minimal lighting (compared to the clunky road oriented TS instruments and lights) and able to be road registered. The engine was basically an RM engine with altered gearing and porting, and heavier flywheel. They were produced from 1977 through to 1984 in 175, 250, and 400cc models. The British team entered 3 PE250s into the 1976 Austrian ISDT and carried off 3 gold medals. The DR-Z series is perhaps the biggest selling Dual Sport bike ever. 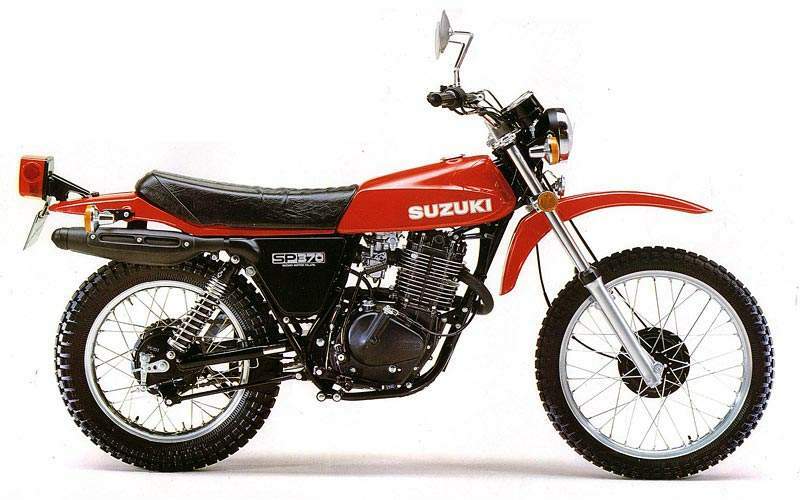 Suzuki’s four-stroke series began in 1978 with the SP370. It was Suzuki’s first single cylinder four stroke engine. They are very popular with collectors today, heavily modified versions were used in various forms of racing. In 1980 the DR400S and DR500S were introduced and continued on until today’s DR-Z series. The popular DR350S which ran from 1990 till 1999 and the DR650R Dakar are two standout models, the DR650’s long-distance reliability lending itself well to adventure riders for its on and off-road performance. The DR-Z125, 250 and 400 models available today continue with the proven reliability and are styled to mirror the RM-Z and RMX motocross models. 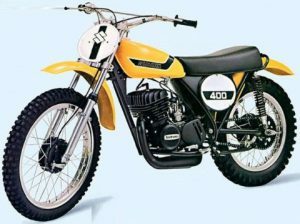 The RM ‘Racing Model’ series was introduced in 1975 with the RM125M, and almost overnight the motocross field turned yellow. It was the first of the lay-down twin shock versions which began the long travel suspension revolution. It was followed on by the RM125A, RM250A, and RM370A in 1976. The RM series continue to be produced today as four-stroke bikes, with the two-stroke versions being discontinued due to lessening demand for the two-stroke and changes to the racing class structure allowing a 250cc four-stroke to compete in the same class as a 125cc two-stroke. The RM series was precluded by the TM series which ran from 1971 to 1975. They were the mass-produced versions of the factory RH and RN bikes which riders like Joel Robert, Gaston Rahier, Roger DeCoster, and Gerrit Wolsink dominated on in the seventies. “The Man” Roger De Coster was born in Uccle, Belgium on 28 August 1944. He began his motocross career with Czechoslovakian manufacturer CZ racing in the 500cc class. In 1971 he left CZ to ride for Suzuki, where he attained his greatest success. 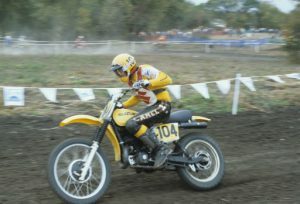 He won the 500cc Motocross World Championship three years in a row in 1971, 1972, and 1973. Heikki Mikkola took the title in 1974, and De Coster regained the World Championship again in 1975 and 1976. In 1980 he joined Honda for one final season, leaving the sport in winning form after taking the 500cc Motocross Grand Prix of Luxembourg at the end of the season. He was successful in other forms of racing, winning a Gold Medal in the 1964 ISDT and also won the Belgian Observed Trials National Championship the same year. After his racing career he moved to the U.S. becoming team manager for Honda and Suzuki, and in 2011 for the Red Bull KTM team. In 1994 he was inducted into the Motorsports Hall of Fame of America. In 1999 he was inducted into the AMA Motorcycle Hall of Fame. Chad Reed joined the Rockstar Makita Suzuki team in 2009 after leaving the Yamaha team. 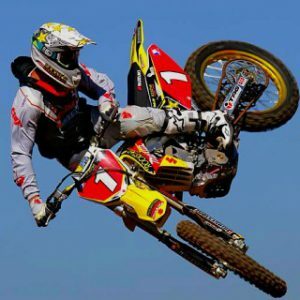 His main rival that year was James Stewart, with the pair clashing numerous times. 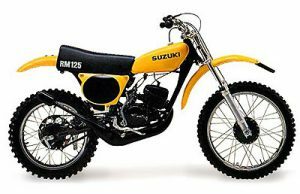 These are just some of the outstanding bikes in Suzuki dirt bike history. There are too many to mention in one post, but as someone that has owned the TS, DR and RM models, I can say they have all been memorable in their own way and all extremely reliable and built to last. This is evident in the numbers of RMs still seen racing at Vintage Motocross events around the world. 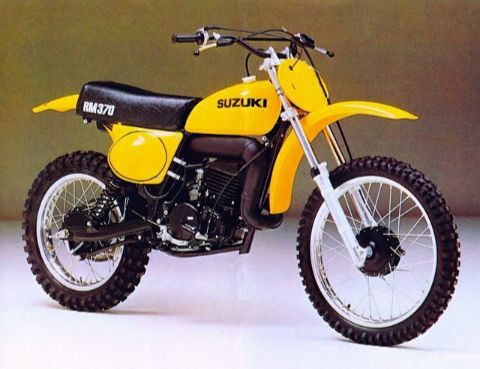 Do you have a favorite Suzuki dirt bike? Feel free to share your thoughts in the comments below. You missed the 1978 DR370 nether first four stroke and the K15 HillBilly 89 cc trail bikes 1965-67. Own or have owned both. Hi Anthony. You’re absolutely right, how could I have missed the DR & SP370. Excellent bikes. I wasn’t familiar with the K15 HillBilly, a bit before my time. I’ll update my post with those bikes. Thanks for your input.